[toc]A healthy Appetite is best described as a persons natural desire or hunger for consuming food. Appetite is very essential for providing adequate energy to the body to carry out its routine functions. A person in his/her life time tend to suffer periodically from either increase or decrease in appetite owing to various conditions and health related factors. Lost Appetite of the person tends to usually come back on its own. However, if one is suffering from appetite loss for long duration of time then it is advisable to get it checked by a medical person as it may be indicative of other health related issues. Some of the reasons which negatively affects the appetite of a person are-stomach flu, depression, stress, anxiety, nervousness, jaundice, throat infection, cancer, general ill feeling in the body etc. A person suffering from loss in appetite tend to become easily fatigued, lose weight and feels tired all the time. Below mentioned are some important herbs which helps in reviving the appetite of the person effectively. Rosemary is a herb that is very beneficial for increasing the appetite of a person. 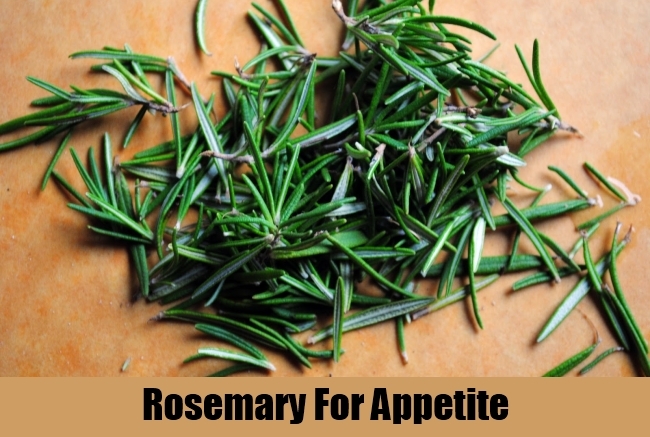 Rosemary has the active ingredient Rosmaranic acid, which is very bitter in taste and helps in aiding better digestion. Rosemary helps in increasing the circulation of blood in all the organs of the body and helps in removing harmful toxins. This herb is very useful for reducing the spasms in the stomach, thereby reducing feeling of nausea and encouraging a healthy appetite.Rosemary calms the stomach and boosts overall being of well being in the body which is conducive to a strong appetite. Rosemary is also very useful in reducing stress, anxiety and tension, which are the main culprits of reduced appetite, thereby encouraging and tempting the palate of the person. Rosemary can be consumed both internally and used externally in form of poultice and essential oils. Thyme has been used traditionally since long to increase the appetite. 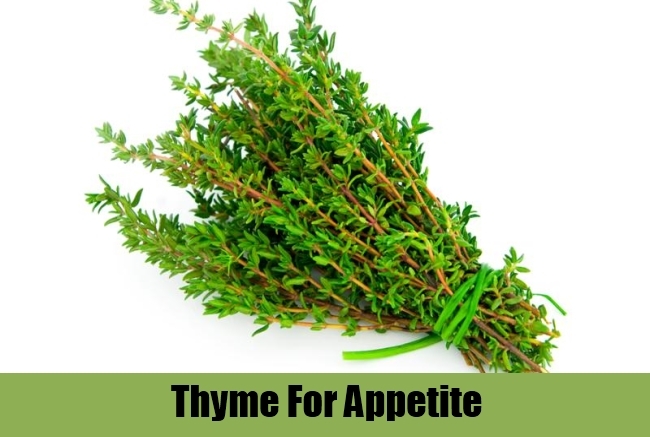 The leaves of Thyme are rich in medicinal properties and have been used effectively for stimulating appetite. Thyme is also very rich in minerals like zinc, iron, potassium etc., which help in improving the digestive system of the body and encourages an healthy appetite. Thyme also helps in improving the overall well being of the body by boosting immunity, curing infections, chronic gastritis, bloating, gas etc. Thyme can be used in daily cooking for increasing appetite and improving the flavor of the dish. 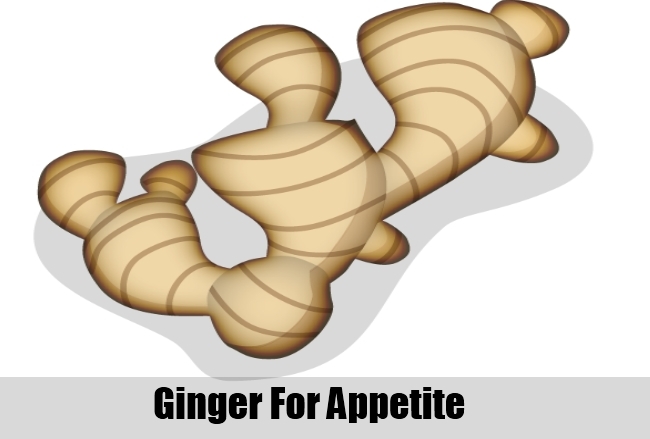 Ginger is another very useful herbal remedy for reviving lost appetite. Ginger contains components known as gingerols, which helps in reducing the inflammation of the stomach tissues and improves digestion. Ginger is also very effective in providing a calm and soothing effect, thereby encouraging suppressed appetite. It has a refreshing biting taste which is not only reduces tension, stress and anxiety, but also provides a warm effect. Ginger is also very effective in warding off other illness and factors which negatively impact the appetite like- gas, heartburn, indigestion, traveling sickness, nausea, gastritis, sever colitis etc. Ginger root can be chewed raw or added to herbal tea. It can also be taken with honey for better results. Caraway has been used since centuries for stimulating a healthy appetite. 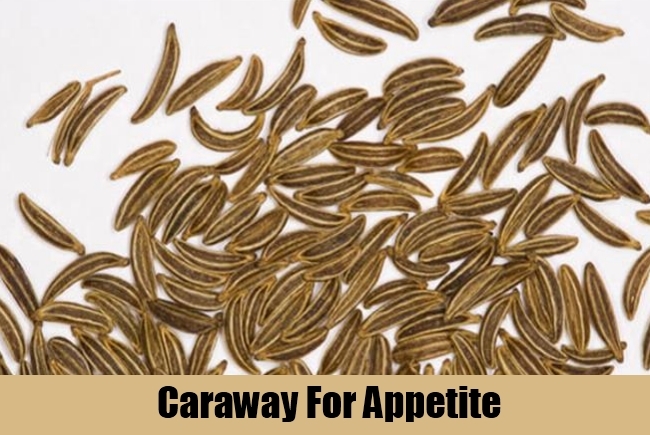 Caraway is especially very useful in providing a soothing and calming effect to the stomach and aids in digesting heavy spicy food. Caraway is an excellent source of important minerals and vitamin which are required by the body for its healthy being like iron, calcium, zinc, potassium etc. It helps in removing constipation and stimulates the movement of food in the body, thereby improving appetite. Caraway is also very effective in removing flatulence and bloating in the body which are appetite killers. Caraway is best effective for increasing appetite when taken in form of herbal tea, seeds, garnish on food, infusion etc. Fennel has been used since ancient times to both increase and fight appetite problems. Fennel is rich in phytoestrogens, which helps in removing the indigestion and colic problems in people. It provides a soothing effect to the lining of the stomach and increases appetite. It can also be effectively used to suppress hunger pangs and mildly reduce appetite of a person. Fennel is also very effective in suppressing nausea, removing gas, elevating stomach cramps etc, which help in reducing the appetite of the person. 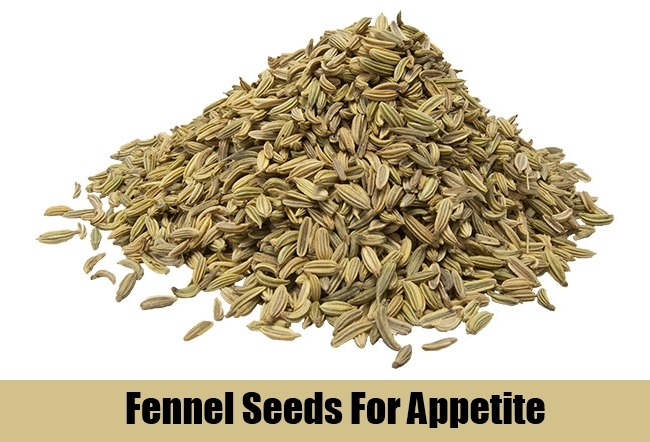 Fennel seeds can be chewed raw, added to tea or consumed in form of capsules and tincture to stimulate better appetite. Dandelion is another very popular herb used for stimulating the dwindling appetite of a person. Dandelion has components which help in reducing the inflammation of the body tissues and stimulates better digestion in the body. 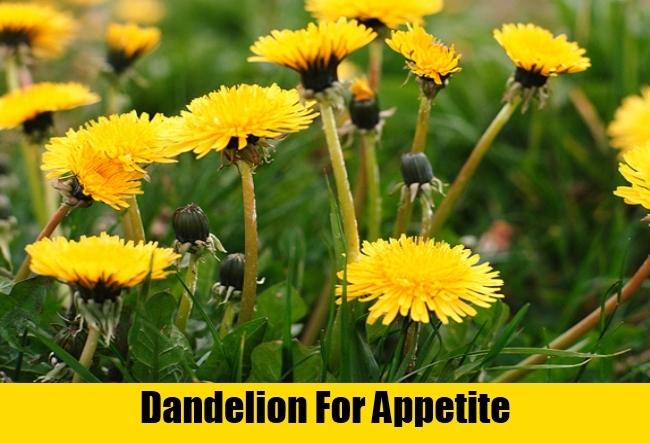 Dandelion is also very rich in fiber content which makes it a very good natural laxative, helping in removing constipation and stimulating appetite. 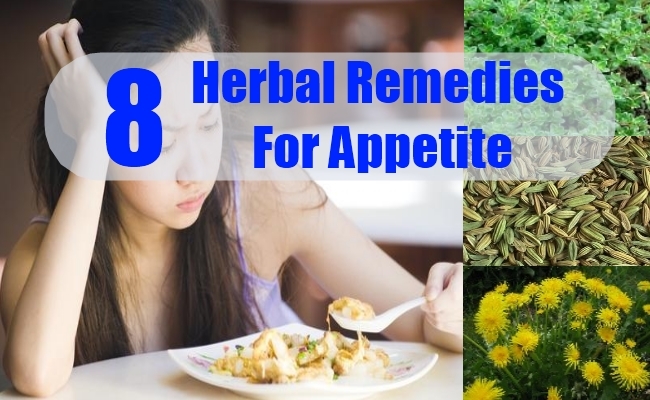 Dandelion root has been proven to be especially effective in increasing appetite. Dandelion can be consumed in form of tincture or juice before meal to encourage a healthy appetite. Parsley is yet another very powerful herb used for stimulating the appetite. The roots, leaves and seeds of Parsley are rich in medicinal properties and has been used for treating a waning appetite since old days. Parsley is very effective in reducing the inflammation of the tongue and aids in better digestion, thereby boosting the appetite of a person. It also helps in boosting the overall energy levels in the body and improves the functioning of the spleen and stomach. 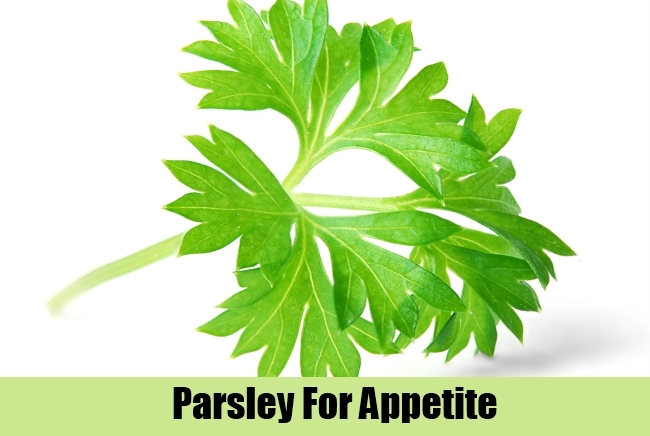 Parsley also helps in effectively curbing the stomach spasms and enables the person to eat properly. Parsley can be consumed by sprinkling it on the salads, in form of tincture, tonic, infusion, tea etc. 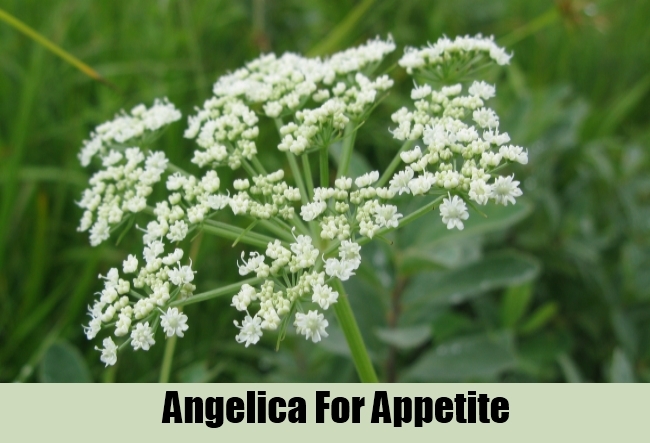 Angelica root has been used very effectively to stimulate the appetite of an individual. Angelica helps in improving the overall circulation of blood in the body, thereby helping in removal of toxins responsible for suppressing appetite. Angelica also helps in stimulating the digestive system of the body to function properly, thereby preventing gas, colic, stomach upsets, cramps, nausea etc. It helps in boosting the immunity of the body and encourages overall harmony in the body which is conducive to hearty appetite. Angelica root can be consumed in form of herbal tea, tonic, tincture, infusion etc.